My family loves avocados. I recently discovered a little farmers market shop that is open all week long. They sell giant bags of local organic avocados for $4! Great deal. So every Monday Max and I head on down to pick up some fresh ones for the week. 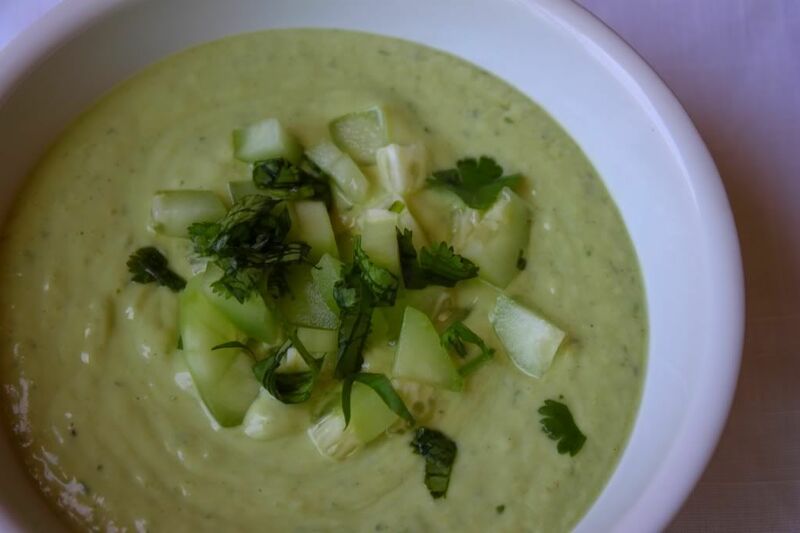 Chilled avocado soup is something I have always wanted to make. It seems so elegant and sophisticated (at least I think so)...so I had this preconceived notion that the recipe would be super complicated... which means I would most likely screw it up. I have a bad track record when it comes to soup making. I once decided to make a completely salt free minestrone soup (HELLO minestrone soup NEEDS salt) and Ian said it tasted like water downed cat food. So when I saw this recipe I thought, "I can DO this." I modified a few ingredients to make my own variation and I could not have been happier with the way it turned out. 1) Combine all the above ingredients in a blender..and THAT'S it!!! I know easiest recipe ever right?! 2) Top it with the cucumber and cilantro garnish. DONE. It was such a delightful, light and refreshing meal. Lesson learned: YES it was delicious! !...but if you have a big guy for a husband he needs more for dinner. I spotted Ian raiding the fridge after my soup dinner ha! this is pretty much fantastic....im gonna try it!!! great recipe--how can you not love avocados?! great stuff. i'm going to try this. Yum! The picture looks amazing - and I can't believe you just throw the ingredients in the blender and it's done! That is my kind of recipe! ooh looks great! I am not that good in the ktichen but I will def try this! im sold, i love avocado and cucumber. i actually might even try to make this tonight for my bf.. hes working late! ill let you know if i do make it! Yay, what a great recipe. I have cilantro coming out of my ears and am looking for new but different recipes (plus we love avocados!). Thanks for stopping by my site! Now following you! Oh, this sounds so good and a great summer soup! oh my goodness, YUMM! Thanks for sharing We totally want to try this. Your blog is FaNtAsTic! We are absolutely loving it! Sooo funny - I was just thinking - I could never serve soup for dinner ... my husband would starve! cukes + avacado = amy's tummy happy. easy too... it will be a must try for me! thanks for sharing!